Disclaimer: This is not medical advice. I am not a doctor, nor do I play one on TV. Keep in mind, everything I know about diabetes is through personal experience, so what works for me may not work for you. And if you decide to try out any of my suggestions, it’s not my fault if you gain 60 lbs or your face falls off or a Pegasus ends up on your night table. Consider yourself warned. I experience the Dawn Phenomenon. Huge kick up in the bloodsugar levels in the morning. This is the Other Big Reason I pursued an insulin pump almost two years ago. (The First Big Reason was frequent, extreme hypoglycemic episodes.) And it wasn’t even the First Thing Testing that was garbage. It was more the raise I experienced at around 8 in the morning. I’d start out at 112 mg/dl and cruise up to 260 mg/dl by the time I got to work. Work stress has been rightfully isolated as a cause. So has the Dawn Phenomenon. Good ol’ Charlene and I had solved that problem. My basal rate is 0.45 all day long, except for between the hours of 5 am and 9 am, when it soars up to one full unit per hour. Big increase there. But it solved the problem, and I’d wake up between 80 mg/dl and 150 mg/dl and I’d still be in that range by 10 am. Nice. Backstory: The Boy is a very fit individual. He reads my blog so I won’t wax on, in that lovey girlfriend way, about his physique, but know that he works out hard and the results are very nice. And he drinks those whey protein shakes and takes L-Glutamine supplements. 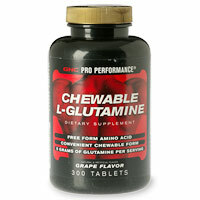 In keeping with my status as the Informed, Involved Girlfriend, I Googled L-Glutamine to check out its effects. And “decreases insulin resistance” came up a number of times. There were also references to lowering bloodsugar levels in Type 2’s and stimulating insulin production. Kerri is now very intrigued. So I gave it a whirl, after calling my doctor and making sure it wouldn’t interfere with my blood pressure and birth control medications. And I noticed a definite change. I was getting low every morning at work. Every morning. Not crazy, 44 mg/dl Get-Me-Some-Juice-I’m-Crying kind of low, but 80 mg/dl instead of the expected 140 mg/dl. I noticed that I didn’t have to take insulin to cover my morning cup of caffeine. So I lowered that morning basal increase just a tad. My bloodsugars remained more even during my mornings at work. To further reinforce my theory, the mornings I don’t take the supplement, I notice some spikiness. Again, we’re not talking about any big deviation, but enough of one to create a pattern. Is L-Glutamine to be applauded for this pattern? Is there some credibility to the supplement craze? I’m taking my insulin and testing consistently and monitoring my diet, but are there other things I could be doing in my Quest for Control? I’m not sure, but I’ve got my theory. Don’t Mind Me. Untethered, After a Fashion. Oh so slightly OCD. Pell Bridge Run.